Another academic term, another food bank drive. It’s great to see our school working together, even if competitively, to make a difference in people’s lives. Access to food banks does make a difference, and every item of food or toiletries our school gives helps makes someone’s day that little bit easier. To follow on from the success we have already had (last year the Trussell Trust received their largest ever donation from us), we have truly exceeded ourselves this term. This year we collected 1150.28kg (over a ton!) which is over double last years figure. Everyone really appreciated the work our school has done this term. Elaine and Jeremy from the Broxbourne food bank said 'The donations are wonderful, the students took onboard items mentioned in the assemblies, there was a lovely basket of baby items with a card written by the girls for the new mum'. Additionally, competition organiser Ms Connor states "It has been inspiring to see the level of generosity from the students here at Herts and Essex in donating food for such a worthwhile cause. Thank you once again to students for their kindness, generosity and the time and effort put into making the event such a huge success." Another first for this year was the introduction of the house system in Y12 for the first time with 12C getting off to a flying start representing Forest. Donating food and hygiene products is effortless. All it takes is 50p to buy something that could help a family survive, so when our whole school works together we can do something great. You may believe that donating one or two cans food, or even a tube of toothpaste, isn’t going to do much but rest assured, it really does. The combined efforts of the whole school has the potential to (and indeed, does) make a huge impact. The Trussell Trust raises money through fundraisers, such as coffee mornings and cake sales. However, their core funding and stream of support is from individuals and organisations that donate on a regular basis. Our school has taken on the responsibility of becoming a regular donor, and we take this responsibility very seriously. We really are making a difference. 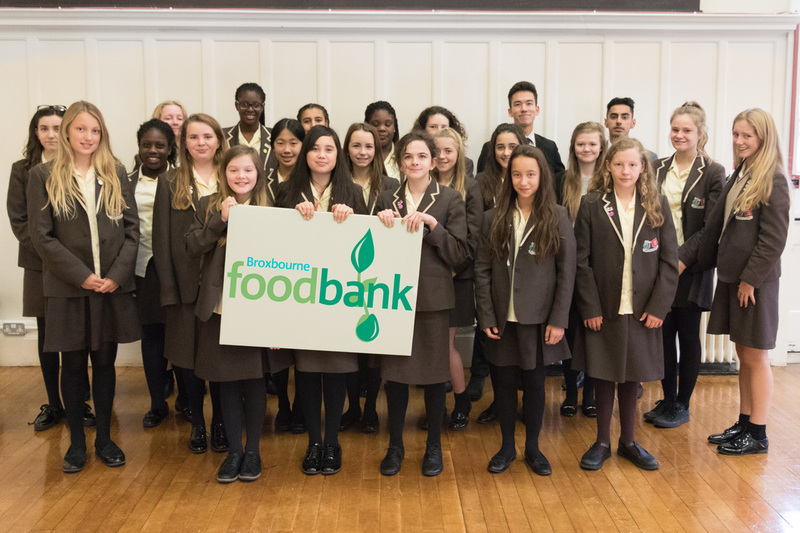 The food bank needs donations all year round, which is why we introduced the almost termly donation drives. We discovered that the Trussell Trust were only receiving donations around Christmas time, and they explained that some months the Food Bank will receive very few items, therefore our regular, termly donations are helping to keep the Trust available to those who need it throughout the year. There has been a huge rise in the number of people using Food Banks nationally, up from 41,000 in 2009-10 to 1.1 million last year, which means that more and more donations are needed to meet demand.